The Best Removalist in Australia | Cheap Interstate Movers ""
Moving houses can be a rather stressful process when taking into account the costs involved with relocating. When considering the large amount of work at hand, the job can also seem overwhelming and daunting. However, at You Pack Removals we will provide you with a safe, clean container that you can pack all your belongings into in your own time and we will transport it all for you. We will deliver the container to your house which you can pack all of your belongings into, then deliver it to your new house so that you may unpack at your own pace. This way, you do not have to rush and can take your time settling into your new home. We are a trusted Interstate moving company who will look after all of your belongings throughout the entire move. We take the utmost care when moving and delivering your belongings. Our service is fast, reliable and we are confident that you will be more than satisfied with our service and our friendly staff. Moving into a new home should be an exciting time for the whole family, don’t let the difficulty of moving spoil the experience. We understand that the process can feel disorderly, unorganised and not to mention costly. This is why we offer an affordable, hassle free service that takes an immense amount of pressure off you. Make moving enjoyable and less stressful on both you and your family. Write yourself a checklist stating a list of things you need to do before officially moving homes. Write down the people you need to notify about your change of address (post office, banks, doctors etc. ), contact utility companies to inform them of the dates that you will be moving and have cable companies install a connection into your new home if need be. Start packing some of the items that get used infrequently well in advance. This will make the task of packing seem a lot less arduous when getting closer to the moving date. Do yourself a favour and label every box according to what room the contents belongs to. That way you can move each box into the corresponding room, saving you a lot of time and any unnecessary extra lifting. Moving house is the perfect opportunity for you to get rid of some clutter that may have built up over the years. Get four large boxes and label each: “keep”, “donate”, “recycle” or “trash”. As you’re working your way through everything, this will reduce a lot of mess and your local charity will thank you greatly for it. This is also a good time to sort through that dreaded paperwork that has been piling up in the study. Start off on good foot with your new home by properly organising and filing your documents. When packing up clothes, fasten half a dozen coat hangers together with an elastic band. Make a small incision at the top of a large garbage bag. Keeping the clothes on the hanger, pull the plastic bag over the clothes and poke the top of the hangers through the garbage bag, then pack all your clothes into a box. This way when you’re in your new home, you can hang up your new clothes, tear off the bag and you’re done! Lastly, don’t forget a bottle of champagne to celebrate when you have moved into your new home! Making the decision to re-locate from Sydney to far north Queensland was by far one of the biggest decisions we have ever made. So when it came to finding a company that we could use to transport all our precious belongings we cautious. However as soon as I made the on-line enquiry to You Pack Removals I was at ease. I received a call from Naomi who was super friendly, polite and extremely helpful – I didn’t need to look anywhere else. The container was delivered on time and professionally along with ties and blankets to use to secure our belongings – it was also clean inside. We then had the time to pack it ourselves without any rush. It happened that we required a second container at short notice and this was no problem at all – first one was collected and the following day the other was delivered. 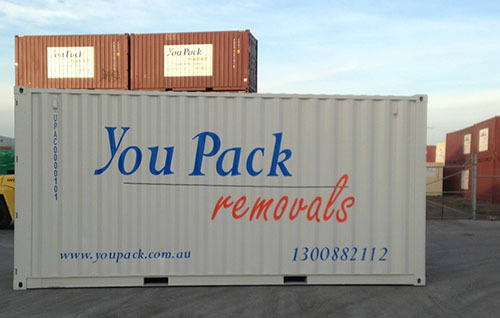 The guys that delivered and collected the containers were also great – professional and friendly. From start to finish and almost on a daily basis with prompt replies, both Naomi and Mel kept me informed of anything and everything I needed to know such as estimated arrival times of our containers to our new home. We also had our car transported with You Pack Removals – another easy and stress free process. You Pack Removals offer outstanding customer service – I would highly recommend them to everyone needing a removal service.